Ambush Advertising: We Must Protect this House! Most of us have been to professional sporting events. The exclamations of food vendors, the crack of the bat, and the beautiful green grass are all familiar to sports fans during spring. Spring is a major sports season when baseball is in full swing and golf, basketball, and hockey all feature major tournaments or playoffs. While sitting at a game, how many of us think about the business and legal agreements that make the product we watch on the field possible? Sports started out as a purely amateur form of recreation but have over the years become a lucrative business. With any successful business comes the opportunity to market the event. Many names and logos for various events are created and, if original, are also protected by trademark against unauthorized use. Organizers of such large sporting events like the World Cup and premier golf tournaments, usually have five revenue streams generated by these events. The first stream is sponsorship fees, the second is gate revenue, the third is exclusive supply of products, fourth is recording and broadcast rights and fifth is merchandising rights. Sponsorship fees have became very profitable and includes the right to display the sponsor’s trademark inside the venue/stadium, the naming of the stadium, the right to use the event identifiers on articles manufactured by the sponsors or the right to use the event identifier in association with a service. The most lucrative deal in sports history involved soccer giant Manchester City partnering with Etihad Airways for sponsorship of the stadium, shirt/jersey sponsorship, and redevelopment of the ground around the stadium to be known as Etihad Campus. The deal was worth £400 million which equates to roughly $652 million U.S. dollars. Sponsorship deals are becoming more prevalent as companies see sponsorship as a way to improve their brand image by associating themselves with successful sports franchises. 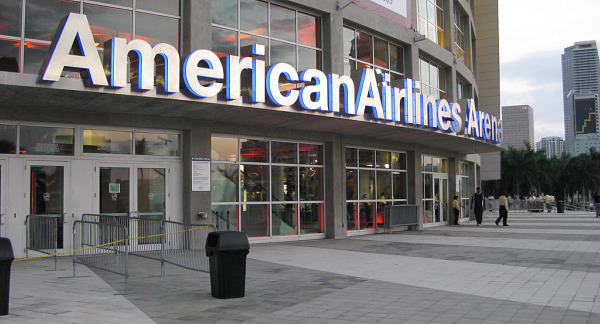 One of the most successful examples of this trend is the American Airlines Arena in Dallas. While American is struggling to fill seats on its planes, it certainly is not having the same problem in its Arena. Approximately 1.6 million fans entered the American Airlines Center over the past year, with the average ticket going for more than $50. American pays $6.5 million annually in corporate naming rights. The Arena earns some $40 million from 144 luxury suites and various signage and sponsorships around the arena, and American Airlines Center rakes in about $8,800 a year from each of its 18,186 seats and luxury boxes. Sports is such a successful business today that according to a Forbes study of top 10 lucrative arenas “no arena on our top 10 list derived more than 4% of its revenue over the past year from corporate naming rights.” However, the most lucrative stadiums tend to be multipurpose facilities that usually feature hockey, basketball, and music performances. The year-round use of these arenas and the high prices for limited seats make them the most financially successful. Baseball and football naming rights deals are much higher as these stadiums have a greater capacity and the sports have greater nationwide appeal. For example, the New York Mets signed a deal with Citi Group in 2006 worth $400 million for 20 years. This trend is likely not going away as companies believe there is benefit to brand recognition among key demographics as a result of arena sponsorships. Given the cost prohibitive nature of sponsorships, some companies have resorted to ambush advertising. Ambush advertising occurs when companies try to associate their products with an event without the consent of the organizers. In order to combat instances of this form of advertising, countries that host big-time sporting events sometimes have to pass legislation. For example, in preparation for the upcoming London Olympics, Britain passed the London Olympic Games and Paralympic Games Act in 2006. Section 32 of the Act states in part that it is illegal to add a symbol, model, or word “so similar to a protected word as to be likely to create in the public mind an association with the Olympic Games or the Olympic movement.” The Act goes on to define the concept of association as “an association between a person, product or service and the Olympic Games or the Olympic movement includes, in particular, (i) any kind of contractual relationship, (ii) any kind of commercial relationship, (iii) any kind of corporate or structural connection, and (iv) the provision by a person of financial or other support for or in connection with the Olympic Games or the Olympic movement.” More countries will continue to pass similar legislation in order to protect their brands and trademarks. The desire to profit from sales due to visibility in front of millions of viewers worldwide is not limited to companies however. Athletes long famous for product endorsement have taken sponsorships to the next level in recent years. Athletes over the years have endorsed everything from shavers to soda. More recently, athletes can be seen in commercials for sports performance beverages, video games, and automobiles. One of the most creative potential sponsorships occurred when Marshawn Lynch, a Pro Bowl running back for the Seattle Seahawks NFL football team attempted to profit from his love of a popular candy. Television and newspapers have reported that Lynch enjoys eating the Skittles brand candy and has often enjoyed them as a celebratory snack after games throughout high school and college. This tradition continued in his professional career as his mother is known to give him a bag before every game. After scoring a touchdown, Lynch can be seen chomping on all the flavors of the rainbow. His most famous Skittles craving occurred during a game on December 1, 2011 against the Philadelphia Eagles. 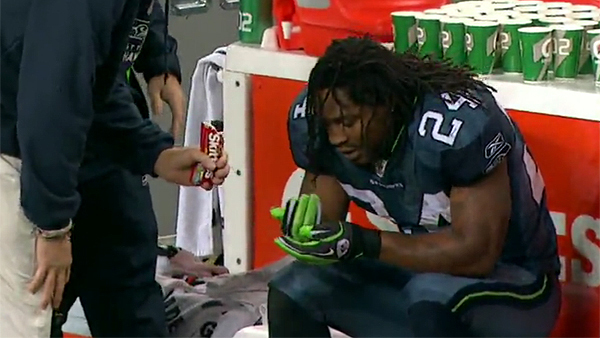 After his 15-yard touchdown run with 9:19 remaining in the first quarter, Lynch was shown on national television eating Skittles on the sidelines. Executives at Mars Inc., the company that owns the Skittles brand, were so happy with the free national publicity that they offered Lynch a two-year supply of the candy and a custom dispenser for his locker as a gesture of gratitude for the product placement. 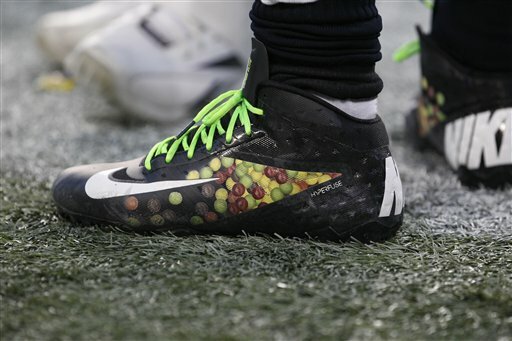 Lynch later sported a Skittles candy pattern on his cleats during a game on December 24th. The National Football League, however, was not amused. The League Office fined Lynch $10,000 for wearing the cleats. They were deemed to be in violation of the League’s uniform policy. The Official NFL Handbook Policy states that “logos, names, or other commercial identification on shoes are not permitted to be visible unless advance approval is granted by the League office. Size and location of logos and names on shoes must be approved by the League office.” This policy leaves open the possibility that with League approval athletes could endorse products on shoes and possibly other equipment. Given the notoriously strict uniform guidelines in professional football and other sports, this seems unlikely however. Marshawn Lynch, however, has shown that athletes will continue to find innovative ways to endorse brands and attempt to gain a bigger piece of merchandise and sponsor revenue.